1. Tell them when they’ve done a good job. We get very busy and swamped with work, but it’s important to give thanks for a job well done. A simple thank you e-mail is a nice pat on the back, but thanking someone in person goes a long way. 2. Be flexible. Some of the best managers are flexible in that they understand everyone learns a different way. Show your employees you care by being flexible with your schedule. Make time to answer questions employees may have and schedule one-to-one meetings in order to give each other updates on work projects. 3. Don’t always be above them. Along with a higher title comes more responsibility and more power. It’s important to be able to relate to your employees in more ways than one. Yes, you are the boss, but employees feel more appreciated if you think of them as peers. It’s okay to talk about things that are outside of work, so long as everyone is doing a good job, having conversations and different types of interactions is healthy for a productive work environment. 4. Create Opportunities For Them. Employees want to do a good job in order to get ahead. Part of helping them feel better appreciated in the workplace means opening doors for them. Sending them to conferences and workshops they are interested in are great ideas. Not only are you investing in them, but they’ll feel appreciated about it too. 5. Significant others and life outside of work. Many people are married with children. Those who aren’t have significant others and family to tend to. Find ways to include the #1 people in employees’ lives by organizing events that include them. These are all wonderful ways and it is always nice to get a Welcome card or Thank you for doing a great job. Or just starting out again. Positive feedback and encouragement from management are key in making your employees feel appreciated. Simple gestures and words of encouragement go a long way in fostering personal and professional growth. The better you feel about the work you do, the more apt you are to put forth the extra effort, because you know it will not go overlooked. 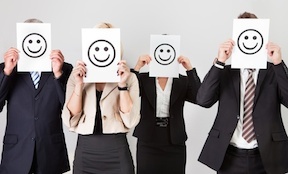 Happy, valued employees make for a positive working environment and increased productivity! yes yes yes yes yes! all of it – yes! treat employees like humans, give positive feedback, all important to a good working environment. I once had a job where all the managers personally signed a welcome card and placed it on my desk to greet me my first day on the job. Boy did I feel accepted as part of the team! Positive feedback is absolutely welcomed, but so is positive criticism. I think it is important for upper level management to have balance when correcting issues in a supportive manner as well to ensure optimal employee performance. These are amazing tips! All too often employers lose focus as to what makes a business successful. Employees are very important and showing them this through these tips will help them be more encouraged to do their best and makes them feel like people who are appreciated. Great job! As a former waiter transferring into a “big boy job”, I was never in an “employee appreciated” work environment. Now being in an office, having understanding and caring “higher-ups” is quite a shock. I find myself not dreading to go to work, but if I dare say, feel excited to come to work where I feel appreciated and acknowledged. It’s important for managers to be approachable — the easier it is for employees to voice a concern or report an issue, the faster those obstacles can be overcome. A closed door policy might be easier in the short term, but an attentive ear will nip problems in the bud. These are all great ways to show appreciation! One that really stuck out to me was Step 4: Create Opportunities for them. This ties directly to an employee’s professional ( and personal) development. Allowing employees to take part in workshops, free training courses or even promoting those opportunities, shows how much a company is invested in an employee’s overall professional growth. In return, the company will benefit from happy employees who feel a genuine sense of commitment towards that company. What better way to say “Thank You” than to openly support your employees who want to strengthen their skills and become better professionals? The rule of thumb for any manager would be. Treat your employees the way you would want to be treated. Its all about mutual respect, understanding, communication. All a great combo for motivated and appreciated employees. Great tips. Bosses should really abide by this list! These are all great ways to make your employees feel appreciated ! What makes me feel most appreciated is the free coffee we are offered to have all day, every day, and how decaf is always an option! Sounds a lot like Prudent Publishing, the company I work for. I wish more offices would adhere to these rules! They really help. All this and more! These are common sense tips that people often forget. All the things you listed are very crucial to the workplace and morale. Good article. Many people point out mistakes, but a lot of people forget to say good job. Great tip along with the others. These are all really important reminders for any bosses out there. Many are simple to do too, but the impact is huge. Good responses to this article. Not something that is often thought of. Listen to your employees. Hear them out. See what their needs are. A few words of encouragement or appreciate really mean a lot to most employees. Creating opportunities for your employees is crucial. No one wants to sit at their desk year after year doing the same exact thing. It gets boring and creates unhappy employees. If you start to give them new challenges and bigger roles when deserved it will keep them interested and they will feel more appreciated for their efforts. While these strategies and tips are important to follow, you also don’t want to go overboard. Some employers almost do too much to the point that it seems fake and not genuine. It really is important to make sure that you are also showing appreciation to your employees and letting them know you notice when they are doing things correctly, rather than picking at every little area that needs improvement. Sometimes people think when someone is doing a good job they don’t need to hear it or they just don’t think to commend them. I feel fortunate to work for a very appreciative company. We get amazing perks as a thank you. While it is nice to organize events to include the family and loved ones of employees, I actually don’t think that is something I would participate in. I really like to keep my private life private and my boyfriend and family completely separate from work. I don’t like to blur those lines. Morale is crucial to employee productivity. If morale goes down it becomes contagious throughout the office and it is very hard to repair. Making sure to follow these tips is a great way to keep employees happy. All of these ideas are perfect! This article is spot-on and all inclusive. This is a perfect template for any company to follow. Previous post: 10th Annual Create a Greeting Card Scholarship Contest – Round 1 Winners Announced!